At the bottom of our last post, we saw the modernised Art Deco woolstore, W4. This building was erected in stages through the 1930s, and was then converted into apartments as part of Brisbane's riverfront renewal. This is what it looks like now. The site was originally developed back around 1910, when Frederick Sturmfels, a grazier from Oxley (now a western suburb of Brisbane) built a woolstore to hold his wool for sale. 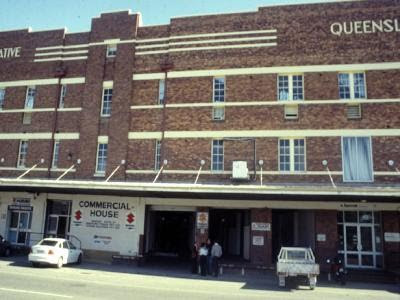 Sturmfels gradually increased his business interests, and eventually merged with Queensland Primary Producers Co-Operative Association in 1941. 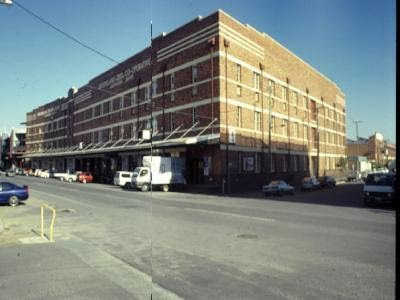 The building continued as a woolstore until it was sold in 1976 to an investment company. It was renamed Commercial House, and was used for storing motor vehicles as well as office space. The image above shows the frontage of the building at that time, and the following one shows a wider view of the frontage and the Helen St side of the building. Isn't it great to see these old buildings retained and re-energised. *nod* I am delighted to see interesting old buildings retained and recycled, instead of being pulled down for multi-storey concrete car parks. Did anyone try to destroy this building? Did local community groups have to fight for its preservation?